LeBron James and the Cleveland Cavaliers will take on the Chicago Bulls in the second round of the NBA playoffs. The Cavaliers’ offense is spectacular; it ranked third, behind only the Clippers and Warriors, in points per 100 possessions. It is built on shooting a ton of threes — the second-most in the league, as a percentage of total shots — and highly efficient attacking drives to the hoop from James and Irving. The Cavs also excel at offensive rebounding, especially Tristan Thompson, who will play big minutes now that Love is out. Admittedly, it’s still not clear exactly how Cleveland will adjust its rotation. The Bulls are tough and will put up a fight, but the Cavs’ offensive firepower, led by James, will most likely be too much to handle. 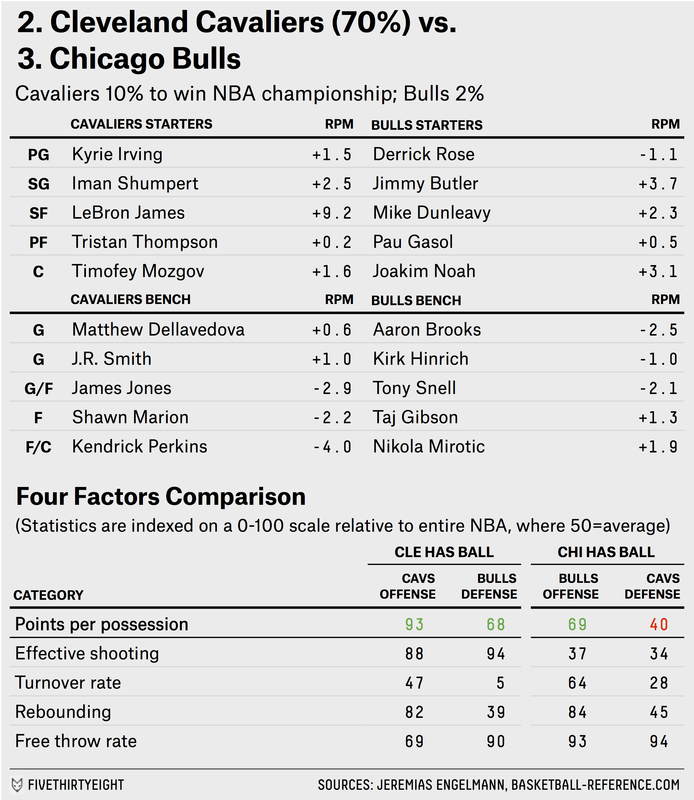 The Bulls, by contrast, win on defense. Chicago held opponents to the second-lowest shooting percentage in the league. The defense carried them through an inconsistent year from Derrick Rose, who was sidelined with sporadic injuries. Rose, however, showed flashes of brilliance in the first round. And Jimmy Butler is the Bulls’ real star — with a +3.7 Real Plus-Minus rating, he’s the second-best player in this series behind James. Rose and Butler will have to have a transcendent series against a short-handed Cleveland team for the Bulls to have a chance. These projections assume he plays 20 minutes per game, down from 32 minutes per game this year.